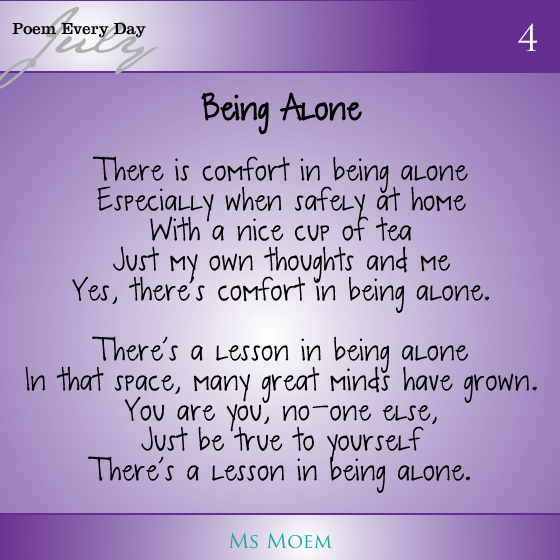 A Poem About Being Alone | Ms Moem | Poems. Life. Etc. Yes, there’s comfort in being alone. In that space, many great minds have grown. There’s a lesson in being alone. A poem by Ms Moem. This is poem 4 in my Poem Every Day In July challenge. The poem prompt was ‘Being Alone’. This is post 74.5 of 100 blogs in 100 days! Pingback: 100 Blogs in 100 days #100blogs | Ms Moem | Poems. Life. Etc.